One of the most unpleasant regular activities in Berlin is food shopping. Which is unfortunate, because I like to eat. Berlin grocery stores are crowded, disorganized and offer little variety, and that’s the expensive ones. The lack of variety is what annoys me most – I no longer even consider complex recipes because I know it’ll require stopping at three different stores and at least two weekly markets. And let’s not talk about the discount grocers. Or, rather, let’s do. Before they built one right next to my apartment, I avoided discount chains like Aldi, Lidl and Netto as much as possible. Whenever I did decide to go shopping in one, I wondered if my life insurance covered discount-grocer related disasters. Their spartan stores are minimally furnished with white tile floors, fluorescent lighting and metal shelves, not to mention weird, hip-level cages for things every grocery shopper needs like socks or, last week, chainsaws (I’m serious). Most products aren’t unpacked from their transport boxes and are just stacked on shelves or directly on the floor, much in the same way a farmer drops a bale of hay in the middle of a paddock of hungry cows. Variety is even worse in Aldi, Lidl and friends — I always run in hopeful that I can make spinach lasagna that night only to leave with just orange juice and cornflakes. The discounters are so bad that I’m convinced even the products are ashamed to be there. To be fair, the stores have improved some over my two decades in-country, but they’ve improved about the same as root canals have improved in that same period. It’s not as unpleasant as it used to be, but it’s still a root canal. But, yes, they’re cheap. 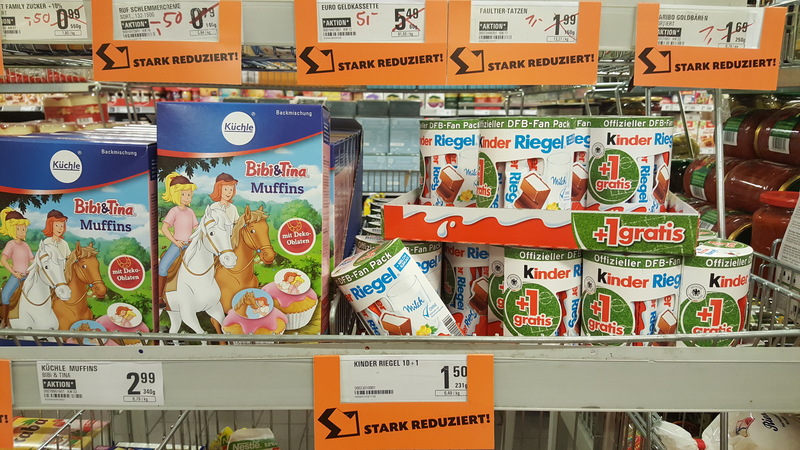 There are both cultural and economic reasons for the dearth of good food stores in Germany. The first is that Germans don’t like to spend money on food. They don’t like to spend money on much of anything, really, but that’s another blog post. Germany’s statistics office tells us that, when it comes to consumer spending, of each €10 Germans spend, only €1 goes to groceries. The French spend €1.33/€10 on edibles while the Italians spend €1.43. Romanians supposedly spend a third of their consumer outlays on sustenance, which sounds odd. To put that in an even international-er perspective, according to a 2016 study by some agency called IRI, Germans spent €21.01 on a basket of food that would have cost €31.54 in the US, or €30.08 in Italy – quite a difference. Still, in the UK, which, in my experience had pretty good grocery stores, that basket cost just €22.14. 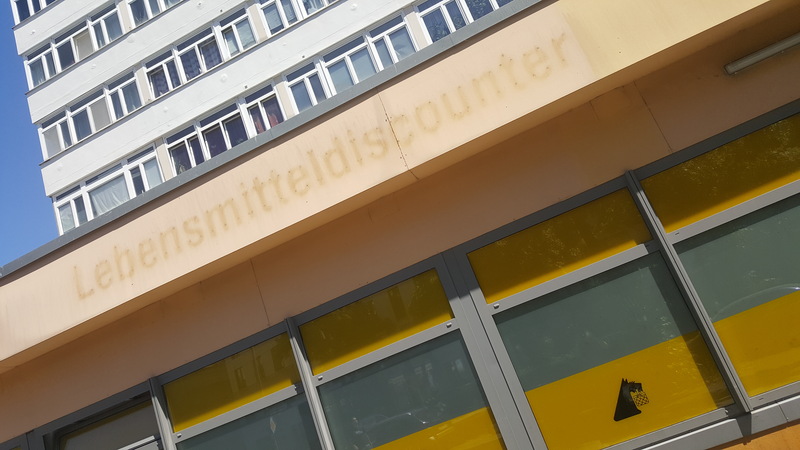 But the other reason German grocery stores are uncomfortable is the German inability to provide – or even a distaste for – customer service. It smarts in areas where companies are forced to offer some kind of service, like when a cashier is scanning your groceries. They quickly rip your items across the scanner and chuck them into the tiny area set aside for bagging. Although you can attempt to bag them as they leave the checker’s hand, the better strategy is to just grab whatever you’re buying and chuck it back in your cart (or basket) and bag them somewhere else – usually the most convenient place is the bus stop out front. Trying to bag your groceries at the cash register can slow things up and lead to disapproving looks and clucks from the cashier and fellow customers alike. The whole affair is so hectic it’s equivalent to half an hour on the free weights in the gym. Checker: Welcome to New Seasons! How are you? Me: Good. Well, mostly good. Turns out a great aunt has cancer. How are you? Checker: Good, only an hour left on my shift. My mother died of pancreatic cancer. Are these organic or traditional avocadoes? Me: Sorry to hear that. Those are traditional avacadoes..
Checker: I’m sure it’ll be OK. That will be $34. Have a good day! Maybe we should just stop cooking and eat German breakfasts for every meal. That would make it all a lot easier. Yet another thing I found magical about Germany (and still do) is the Brötchen, which many falsely translate as a bread roll. A bread roll is something that accompanies mediocre Midwestern meals and is made only marginally better through the introduction of butter. Meanwhile a Brötchen is a tiny, proud loaf of bread. Don’t believe me? It’s right there in the name: Brötchen, which is the diminuitive of Brot, which is bread. When I was an exchange student, the baker delivered a tidy paper bag of Brötchen to my host parents’ stoop early every morning for breakfast, six days a week (we had to rely on frozen Brötchen on Sundays). As an adult in Germany, I enjoy hunting and gathering them on weekends and, as a father, it’s a tradition I’m happily handing down to my German-American kids. Who am I kidding? It’s in their Brot-loving genes! Brötchen come in various flavors and sizes in every corner of Germany and even have differing names — Brötchen in mainland Germany, a Schrippe here in Berlin and a Semmel down in the southern parts where they speak cartoon German. While most humans are comprised primarily of water, the average German is 40 percent Brötchen with the remaining 60 percent a mixture of Bratwurst, lager beer, white asparagus and Goethe (or, sometimes, Hegel). And today I present you: Things Germans put on them. Admittedly, some of these concoctions are not readily available at the neighborhood Imbiss (snack bar) and others may or may not be region- (or age-) specific, but they are definitely things more than one German has told me they bought somewhere, sometime, and loved. Many had tears in their eyes. We made most of these in our kitchen on Saturday and it was, as the Germans say, as fun as a bag of Brötchen (they don’t actually say that). Formally this is a Hippie Brötchen, but what makes it so hippie dippie I have no idea. The idea is understandable though as I used to love crushed up potato chips on my sandwiches. But mostly I think the idea was to create a holder for the fries since these seem to be popular at public swimming pools. The Brötchen can much better withstand a wet, chloriney hand than, say, the traditional paper bag fries come in. The Hippie Brötchen looks good. It tasted even better. Ketchup and mayo, of course (rot weiss, for those in the know!). Well, not just raw pork but seasoned raw pork with onions, salt and pepper. This has various names but usually a Mettbrötchen, because of the kind of meat. My German in-laws call it a “gehacktes Brötchen“, because the meat is all hacked up, basically. And they love them. German sushi, I guess. I’ve not had many of these and I bought this GEHACKTES BRÖTCHEN at a supermarket in Potsdamer Platz for this post and I only finished about half of it. I like steak tartare. I didn’t like this. My wife and I have a battle that occasionally flares up about whether Nutella and peanut butter are for dessert or meals (Nutella is clearly a dessert food, I contend). She’s made some sound arguments but sometimes Germans just throw the boundary between dessert and meal out the window and flat-out put chocolate on their Brötchen. And, as I learned, don’t look for this chocolate in the chocolate aisle, it’s right there in the breakfast spreads aisle next to peanut butter and above Nutella. As you can see, my son couldn’t wait for me to take a picture before digging in. The small, chocolate sheets are known as Eszet, which is a play on the ß letter (aka: Esszet) but is actually an abbreviation of its two inventors … yes, it took two Germans to come up with this idea. To get the oil on this Brötchen, you first need to get the Brötchen in the deep fryer. Really. These are generally called “Gammler” or, if you’re in Düsseldorf, a “Fortuna” and it’s just a deep-fried Brötchen. “Gammler” means “bum” so I guess it’s the cheap thing you get at the snack bar when the dust bowl has you down on your luck but I don’t see what’s so slummy about it — it was pretty tasty, and would be even tastier if it were fried in a gross-ish snack bar deep fryer that had already fried everything known to man and retained some of the flavor. Like a bar mat shot but with frying oil. Yes, I know what Schaumküsse (foam kisses — the chocolate thing getting smushed in the gif) used to be called, can we move on? That’s my wife hand-crafting this heirloom Ditschbrötchen and when I tasted and said it wasn’t that great she said: “Imagine being hungry on the schoolyard and with it coming fresh from the baker’s car.” I still don’t think it would taste good but I get her point. Anything else I missed that Germans put on their Brötchen?